Listening to Coleman recite changed my understanding of black poetry. I spent Saturday afternoon raking leaves around my house in North West Washington, DC. Tired, I took a break and went indoors for some water. I checked my e-mails, only to learn that the poet and writer Wanda Coleman had died. I looked out at my yard and watched the wind blowing and the many leaves that kept falling. It’s the same with tears. Wasn’t the sun just out and laughing with poet Jayne Cortez? I pulled several of Wanda’s books from my bookshelves: Mad Dog Black Lady, Bathwater Wine, Heavy Daughter Blues, African Sleeping Sickness, A War of Eyes and Other Stories and Imagoes. They are all Black Sparrow Press Books. There are others, and one wonders if her editor was Hitchcock. The woman was extremely prolific. It was Southern writer Ahmos Zu-Bolton, the founding editor of Hoo-Doo magazine who first told me about Wanda Coleman. He spoke of her as if she was Lady Day and I had yet to see or smell the gardenia. I met Wanda for the first time in 1984. The actual time, date and place was September 25, National Airport, United Flight 802. Time of arrival 10:22 am. I had invited Wanda to give a poetry reading at Howard University. Sadly, only four people came. Two were white students attending the University of Maryland. They came to hear Wanda the way people first wanted to grab a glimpse of Jimi Hendrix. 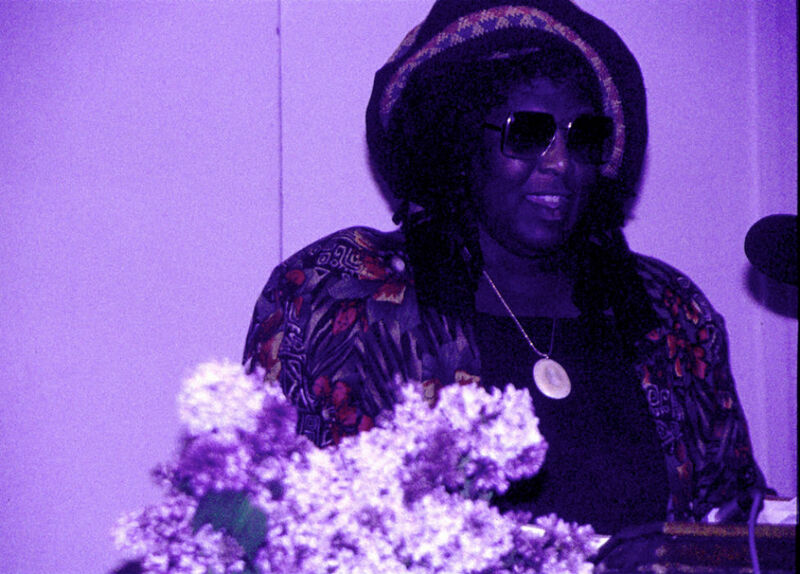 The hip people loved Wanda Coleman the same way they took to Charles Bukowski. A name that now and then people would whisper alongside Wanda’s, as if the two would be connected forever by geography and the hardness of life. Listening to her recite changed my understanding of black poetry. Her voice was unique and made my ears look for instructional notes. Coleman was more grassroots than Carolyn Rodgers, Audre Lorde, Nikki Giovanni or Sonia Sanchez. Wanda didn’t just live in Los Angeles—she was LA. While some writers are associated with creative writing programs or a style, Wanda needed a city—a place to define her, a place she defined. She worked in a variety of jobs trying to make a living, including being a waitress, medical file clerk and script writer. Wanda Coleman was a serious letter-writer. As we move deeper into the age of electronic media this might soon become a lost art. Wanda sent me long letters. I published several of them in Callaloo magazine when I was younger and the editor still spoke to me. Form followed Wanda. She wrote many sonnets. She dedicated them to friends. I was honored to find one written to me in her collection Bathwater Wine. A year ago we wrote a poem together. I will miss this woman like so many of us who count the words that leave our breath. In one of her books I found a letter dated January 31, 2010. In it she thanked me for nominating her for a Gaea residency in Provincetown. This letter is of one of the few very happy notes I received from her. It serves now as a reminder of how too often great writers struggle to make a living, to write and to love. If in small ways we help one another the world upholds its beauty. Tomorrow I will complete the work in my yard. I suspect the leaves will stare at me with compassion and sadness. I have raked them for memories of spring and summer. I will stand in my doorway and listen for Wanda’s voice in the wind—a sound as beautiful and as different as each new day. E. Ethelbert MillerPoet E. Ethelbert Miller is chairman of the board of the Institute for Policy Studies.